On 2 March 1244 the Cathars negotiated a fifteen day truce at the end of which there could only be one outcome for the 'Friends of God': fire. There was no Inquisition for them, no judicial process. Their oath had made them perfectly heretical and the legal punishment for heresy was fire. We can speculate that the fifteen days were one last desperate attempt to win time in the hope that the feudal lord of the territory, Count Raymond VII of Toulouse, would return from Italy and put an end to the siege. They had hopes, but unfortunately for them they were dashed: Raymond was bogged down in long negotiations between the Pope and the Emperor and would not return to his territories for months yet. On Sunday 13 March, the third Sunday in Lent, three days before the deadline for the end of the truce, twenty-one men and women who might otherwise have walked away took the consolamentum. They did this in full knowledge of what awaited them. The hot-blooded massacres at the highpoint of the Albigensian Crusade may shock us. But the studied calm of the fifteen days of preparation for that immolation, combined with the voluntary choice of a fiery death by the twenty-one, is one of the factors that makes the massacre of Montségur stand out in an age of atrocities. The attackers built a wooden pallisade on some level ground at the foot of the hill and filled it with wood. On 16 March, the morning that the truce ended, the cenobites of the Cathar village were taken down the main track. The wood in the enclosure was lit and 224 of the 'Friends of God', men and women, were tossed from ladders over the pallisade into the fire. The sick and injured were thrown in still on their stretchers. On that 16 March 1244, Rome and the King of France decapitated the upper hierarchy of the forbidden church which, deprived of its leaders, would be henceforth condemned to a clandestine and precarious survival. However, they did survive for another 77 years. But with the fall of Montségur and the torture of its Bishop Marty and his companions, the guiding light was extinguished. The 'Friends of God' entered a long and terrible night whose only illumination would be the bonfires of the Inquisition. After the fall of Montségur the inquisition did its work and eliminated the remnants of the Cathars in France. Some fled to northern Italy, where they mistakenly felt they were protected, finally arriving at a castle in Sirmione, a town on a peninsula in the Lake of Garda, a place known for an allusion to its laughing waves by the Roman poet Catullus. The waves were not laughing in 1276 when the fortress was taken and two years later 178 Cathars – nearly as many as had died at Montségur about 30 years before – were burned to death in the nearby Arena of Verona. For about another 70 years after that the inquisition dealt with isolated outbreaks of Catharism or its variants with trials and burnings, but after that the heresy ceased to exist. The riches of Languedoc had fallen into the hands of the King in Paris. The religious competitors had been turned to ashes – literally. Mission accomplished. We play our little historical game: if only the Cathars had guarded the pinnacle path properly and had repelled the commando raid; if only Raymond VII, Count of Toulouse, had returned from Italy and protected them as he had done up until then; if only… There might have been three churches in Europe: the Church of Rome, the Church of the Friends of God based in Toulouse and the Church of Constantinople. 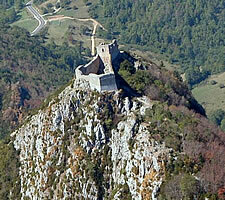 At modern Montségur there is next to nothing of the Cathars to be seen. The fort and village were completely razed, a Canon Law requirement for the homes of heretics, the roofless walls that stand there today are the remains of a castle that was erected by the son or nephew of Guy de Levis, who had acquired it by right of conquest when the Montségur succumbed. This is the ruin of a fortress of the conquerors, not the conquered. Repeat after me: this building has nothing to do with the Cathars nor is it a temple for sun worship. There is a ticket hut (money please! ), a zig-zag walk up a hill, parts of which may be the original route. There is a fine view across an interesting landscape. If you make the effort to trudge up the path, then by all means observe the ruins with respect, but not veneration. For the most visible ruins are the remains of a pointless structure whose time had past. All over Europe the mighty were descending from their strong-looking but ultimately indefensible hilltops to the civilised comfort and greater security of the towns and cities. What is the point of being holed up in a draughty pile on the top of a hill whilst your enemy possesses your land, your crops, your animals and your serfs? 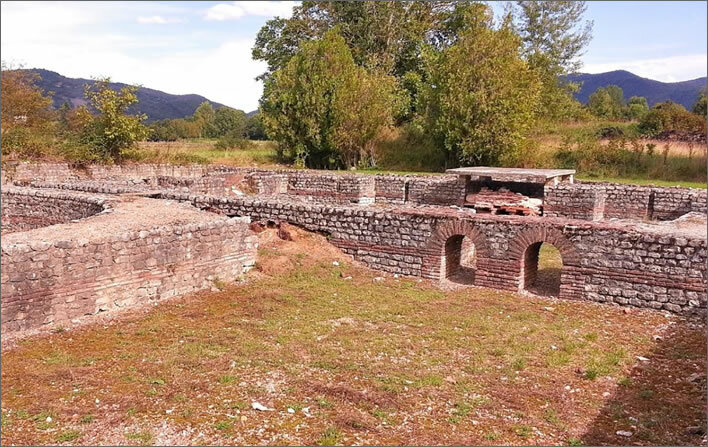 Even worse, these remains are what is left of a castle erected by a descendent of one of the victors of the siege, a man who had watched Montségur's former occupants thrown over the pallisade into the fiery pit. A man who never even lived there. There is a flat area at the foot of the hill, traditionally the 'Field of the Burned', the location of the fire. A small stone monument faces it. The contemporary monument at the Field of the Burned. Vaut le voyage? If you like climbing hills and spectacular views over the Provencale landscape, of course. If you want to find Cathars, they are no longer there, or barely a trace. The victors of the Albigensian Crusade and the siege of Montségur had no interest in preserving the traces of the Cathars. The hill itself and its name are their only real monuments. Nine bodies of those who died in the siege have yet to be found and some small artefacts are in the museum. Even a century ago, in 1919, when the poets Ezra Pound and T. S. Eliot walked the old roads looking for that high civilisation of Provence it was long gone. 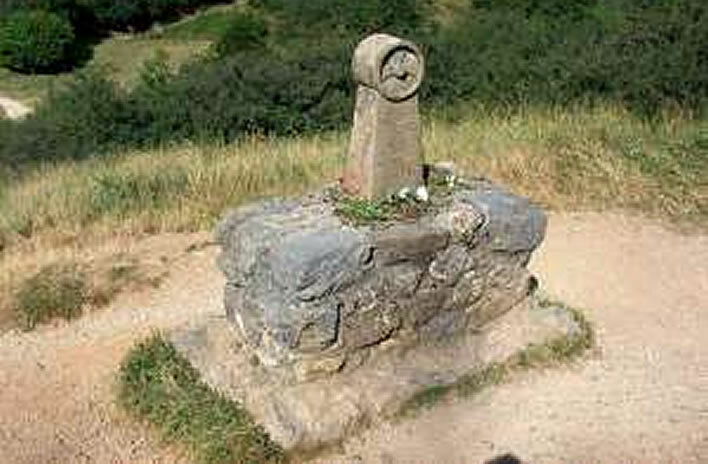 Pound and his wife Dorothy climbed up to Montségur. 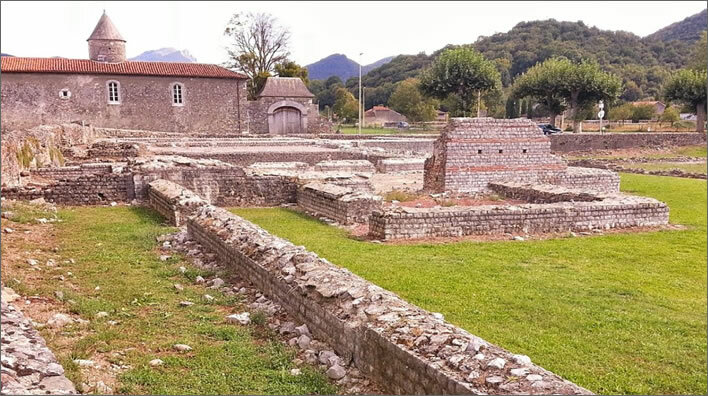 Pound is referring in 'what had been' to the once great Roman settlement of Lugdunum Convenarum, nowadays known as Saint-Bertrand-De-Comminges, then an important location on the crossroads of major European north-south and east-west routes. Gregory of Tours tells us that the city was 'razed to the ground' and all its inhabitants butchered in 585.
the flat stones of the road, Mt Segur. 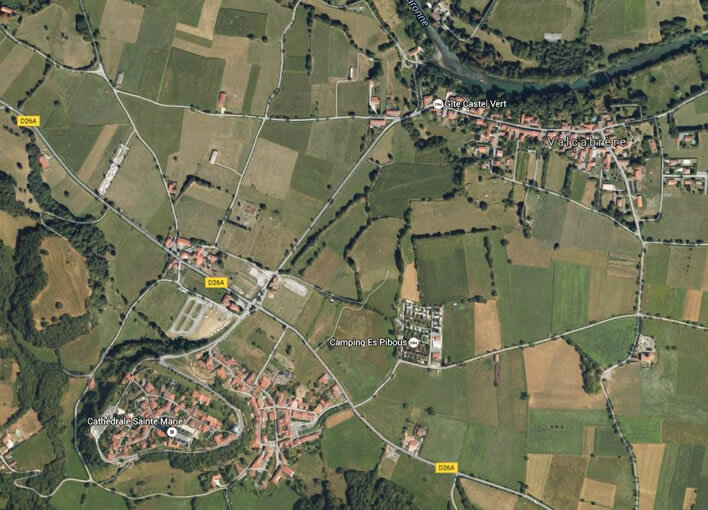 The road between Saint-Bertrand-De-Comminges (bottom left) and Val Cabrère (top right), where once there 'were two miles of roofs to San Bertrand': now flat, apart from the excavations on the northern edge of Saint-Bertrand, alongside the road. Two views of the recent excavations. The castle of Excideuil was abandoned and fell into ruin from the start of the seventeenth century. ^ Roquebert, Michel. Montségur: les cendres de la liberté. Toulouse: Privat, 1998, p. 10. Ce 16 mars 1244, Rome et le roi de France avaient décapité la haute hiérarchie de l’Église interdite qui, privée de ses chefs, serait désormais condamnée à une survie clandestine et précaire. Elle survivra pourtant, soixante dix-sept ans encore. Mais avec la chute de Montségur et le supplice de l’évêque Bertrand Marty et de ses compagnons, le phare à coup sûr s’était éteint. Les « Amis de Dieu » entraient dans une longue et terrible nuit que seule illuminera désormais la lueur des bûchers de l’Inquisition. ^ All the references to The Cantos take the form [canto number:page number] and relate to The Cantos of Ezra Pound, Faber and Faber, London, 1975.